"Patients suffering Parkinson’s disease have serious tremor that happens whenever they try to grab something with their hands. More accurately it happens whenever they focus on the part of their body because their brain is damaged thus cannot control the body on their will. Major disadvantage that comes with this symptom is not being able to eat on their own. However, using this self-stabilizing spoon, we can fix this." I'm presenting my prototype in the class. Above you can see the spoon stabilizing itself. One day I saw people suffering Parkinson’s disease on TV and felt bad for them. I googled if there was a decent solution for them and found a decent self-stabilizing spoon made for them. However, I wanted to try it out by myself with Curie Nano so that I can maybe find some things to improve while making it. However, the prototype I’ve made is not perfect. The input values don’t get smoothly processed to motor, making a clumsy move. I might get smoothed out if I used better algorithm but that’s out of my reach for now. But it is still satisfactory to see it in action. Now let's briefly see how we can make this. The platform used in the above picture is Curie Nano, which is a recently released new chip from Intel. However, using Genuino 101 also works just fine as seen in the video. 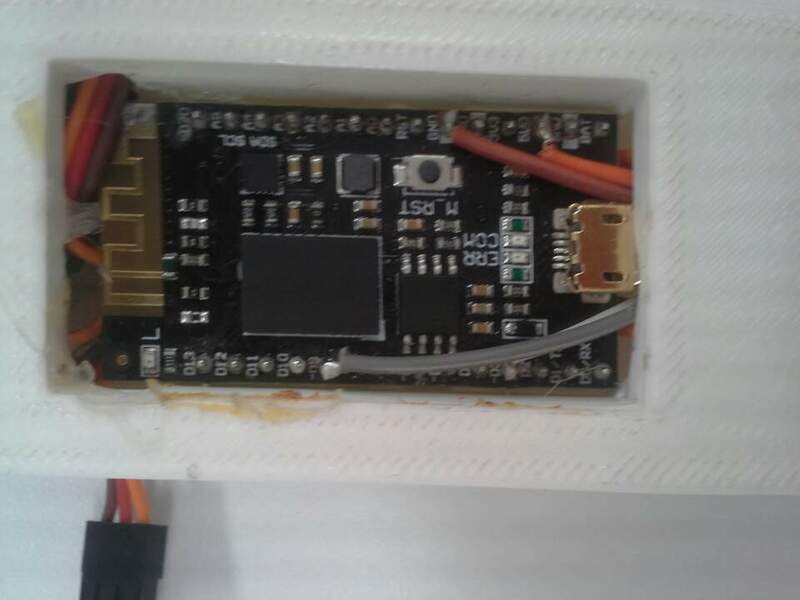 * If you are using Curie Nano, you'll need to solder the chip for a better connection. Nano doesn't have default pin installed. You can compare the two. Nano is significantly smaller. You have to first make 3D printed frame for the spoon. This case, it is hard to say it's a "spoon" but let's assume that it is. Then, you connect 2 servo motors to it, making 2 axis for the stabilization. Lastly, you glue a chopstick or any rod and little cup in the front, making a real "spoon". The pictures for each step are below. 1 / 3 • 3D printed frame for the chip. When everything is connected and set, you now have a complete spoon for Parkinson's sufferers. There wasn't tremendous improvement from the decent smart spoon in the market, but making this all by my self helped me sympathize the patients and better understand technology behind helping them. it's pretty old project so I don't have its exact schematic. Instead, I have a picture of the chip connected with other components. The code for the project.